It’s a wet and windy spring morning in Melbourne’s CBD. 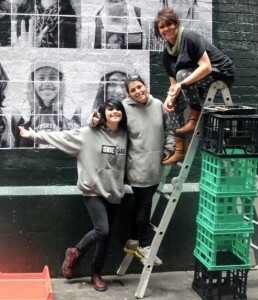 A group of young people are battling the wild weather and pasting sheets of paper to a brick wall opposite a busy exit from Flinders Street Station. Several sheets later, a pair of eyes stare out from the wall, then a nose is added – a face takes shape. Paste ups, or graffiti created by drawing, cutting out and then pasting paper to walls is a vibrant part of Melbourne’s street art culture. These young artists are contributing to the flourishing artwork of Melbourne’s lanes and alleyways in a new project called ‘Break Out’, which is aimed at keeping young adult students engaged with learning during college break time. In this two-week program, students explore Melbourne’s streets for inspiration, learn design and media skills, and work as a team and to produce and exhibit their artwork – a series of portraits of the people who populate Melbourne’s Degraves Street. The VCAL course ‘gives students a sense of community, it’s a place of certainty and security’ but it can be fragile and staff worry about some students when term break time comes around Clare says. Without the routine and the network, boredom and even depression can set in. And in Clare’s experience, that can mean trouble. ‘Break Out’ is a project aimed at helping all CAE students aged under 24 to use their break time constructively. For VCAL students, it not only offers a chance to stay connected to their course and classmates but it counts towards their qualification. Clare Kellett says that when she started at the CAE four years ago, most of the CAE’s VCAL students were troubled young people from difficult backgrounds who’d dropped out of school and most often referred by youth welfare groups and networks. Now the demographic is shifting, Clare says, with an increasing number of students referred by school careers counsellors who see that a different kind of educational experience may well be the way for a student to blossom. VCAL can be a pathway to work, to further training, to trade and industry and further and higher education. The CAE VCAL program currently has around 80 students enrolled. The challenge for Clare and her staff team is to create classes that focus on their students’ strengths and help them overcome barriers that might have hindered learning in the past. The flexibility of the VCAL year 12 curriculum allows staff to develop a range of creative projects to keep their students engaged and actively learning. The ‘Break Out’ project was initiated and managed by Project Leader Marie Baird.